PTFE Gasket is a mechanical object that fills the space between empty spaces to prevent leakage in joined objects. 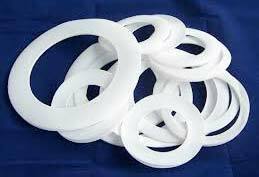 We are offering PTFE envelope gasket, PTFE gaskets - ready cut gaskets, envelope gaskets, PTFE solid ring gasket, spiral wound gasket, PTFE o-rings, washers, PTFE seals etc. We manufacture gaskets keeping in mind the products it is used with. Hence, we make Gaskets with an amazing strength and with materials that are suitable to work in any extreme temperature. We supply and export these with demand of the size that our customers require. Available in PTFE filled compounds: glass fiber, carbon, graphite, bronze, molybdenum disulfide (mos2).